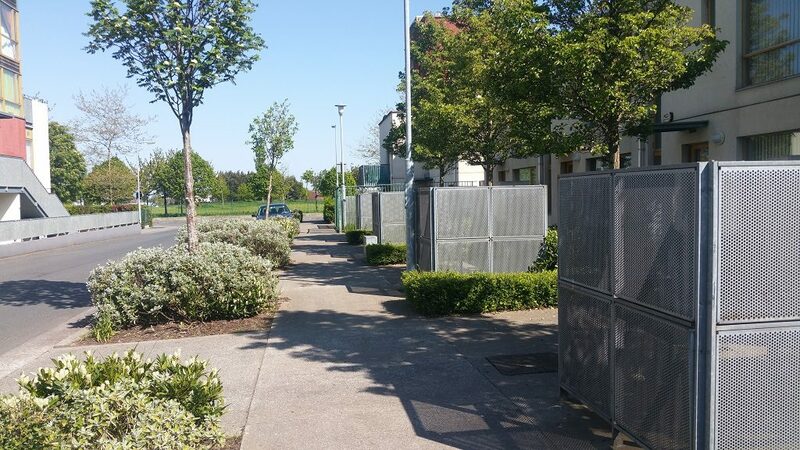 Dublin’s conventional suburban “semi-d” has often been quoted as an unsustainable solution with a need for greater housing density and affordability required. 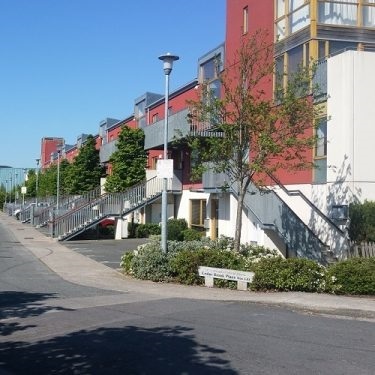 Cedar Brook, originally developed in 2003, provides a radically different affordable housing scheme, billed at the time as ‘the first of its type’ in Ireland and a ‘model for housing developments throughout the country’. 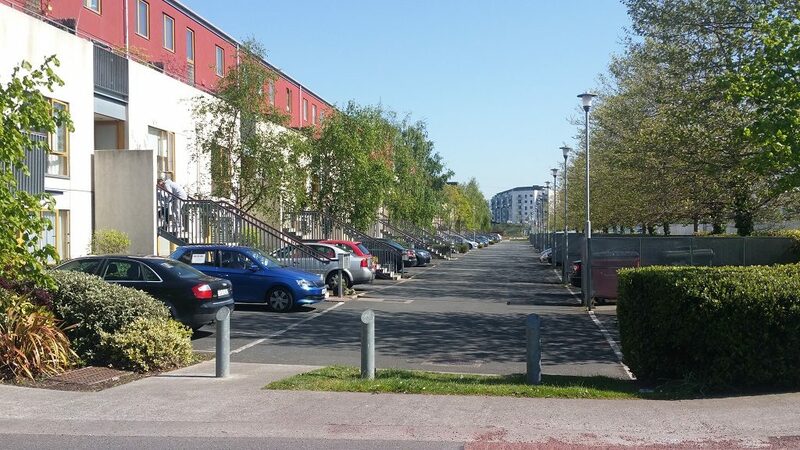 A joint venture by Park Developments, John Sisk & Son and Dublin City Council, it contains 374 apartments and terraced houses on a 10-acre site in Cherry Orchard, giving a remarkable density of 37 homes per acre. It is unique in many ways but particularly, it was aimed at providing housing on a fast-track basis using new construction methods. At the time these were the least expensive homes on the Dublin Market but with a very high specification being provided. 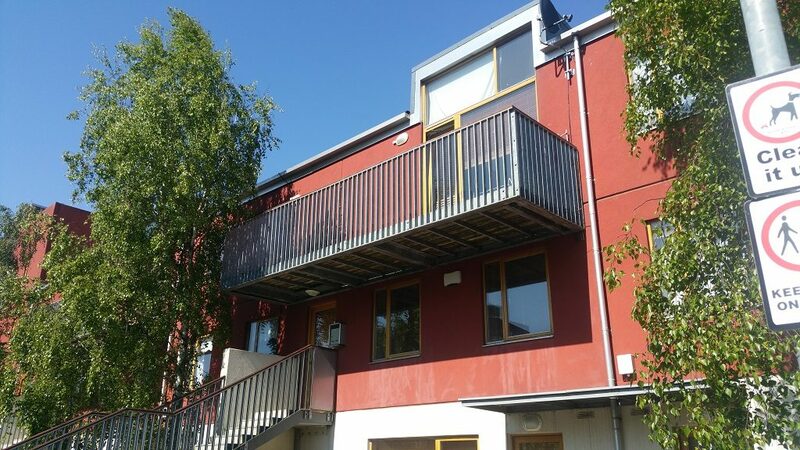 Recipients of the RIAI Irish Architecture Award 2004 for this development, O’Mahony Pike Architects designed Cedar Brook as no conventional Irish housing estate. The scheme is laid out in five terraces around a landscaped central park with a pedestrian promenade running through the centre. Most of the buildings are three or four storeys, with apartments at ground and first floors and duplex townhouses above. A number of different products were chosen and these, as stand-alone products, were not innovative but all together provided a new and innovative project. 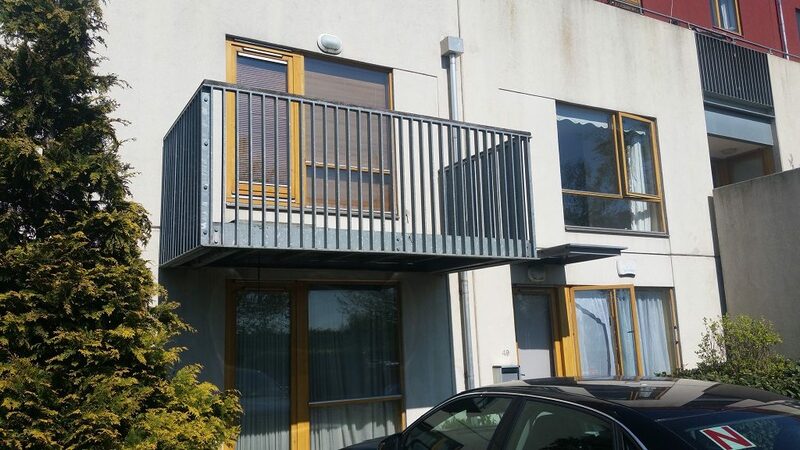 Amongst these the choice of Hot Dip Galvanized steel throughout the development stands out as a very significant feature of this innovative thinking. It works on many levels, not all of which are immediately obvious but all of which contribute to the sustainability of both the design and the development itself and were carefully considered in the design process. One of the advantages of hot dip galvanizing is the speed at which it can be processed in a factory controlled environment which then arrives on site complete and ready for erection with no further finishing required. All Galco galvanizing plants offer a guaranteed turnaround service with 80% of material being processed within 3 working days of receipt. The Hot Dip Galvanized coating is not like any other coating available. It is metalurgically bonded to the steelwork and the combination of zinc-iron alloys provides a tougher and more abrasion resistant coating than steel itself. This allows it to be easily erected without the need for touching up afterwards as would be the case with painted finishes. Another key feature of Hot Dip Galvanizing is its durability. Not just because the coating is so tough but also because zinc corrodes at a very slow rate of approximately 1 micron per year in an urban setting. 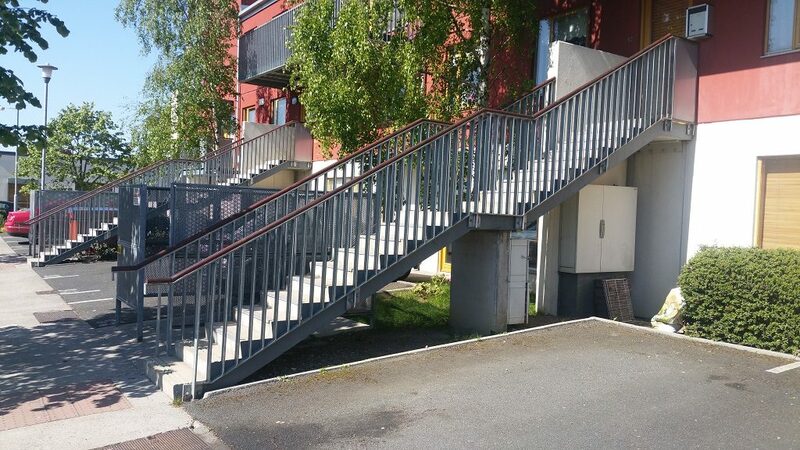 Given that most of the steel in Cedar Brook would have coatings well in excess of 85 microns, this ensures that the staircases, balconies and many items of street furniture will last in their present state for another 50+ years. One of the other key benefits of such a long life is the complete lack of maintenance required. 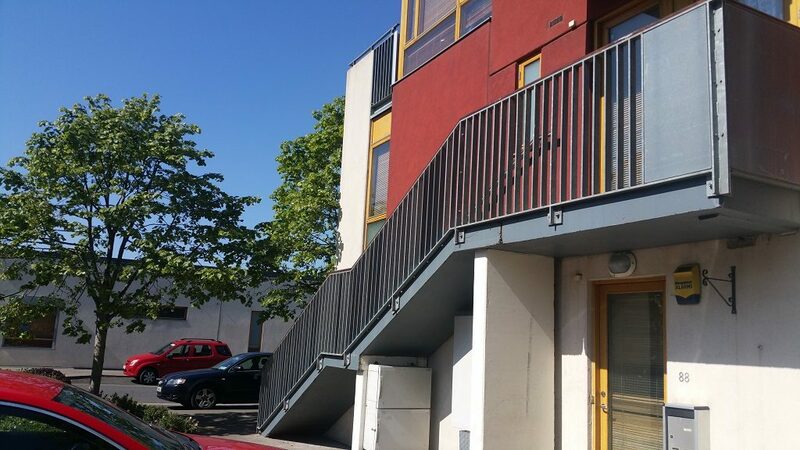 This development is already 14 years old and while it will be necessary to re-paint much of the concrete structures no such maintenance has been, or will be required for the steelwork, at any stage in the next 50 years. Hot Dip Galvanized steelwork provides a fantastic opportunity to bring two naturally abundant materials, iron and zinc together to offer one of the most sustainable building materials available. Zinc is present is soil, plant and animal life and it has been acknowledged in an EU risk assessment that galvanized products pose ‘no threat to the environment’. By providing such a long, maintenance free life it also eliminates the need for three to four paint cycles. This means that in life cycle analyses, Hot Dip Galvanized coatings are consistently shown to consume approximately one third of the energy and generate less than 40 % of the harmful gases created in other processes. This development at Cedar Brook has clearly lived up to its billing as a ‘new model of housing’ and demonstrates how it is possible for new urban centres to be developed in a well-designed and sustainable way using products that work together to provide fast construction, affordable prices and sustainable buildings all at the same time.